Add the glow of Christmas lights to a bowl of glass Christmas ornaments for a designer decorating look in minutes! In minutes you can have this great little decorative bowl. The photo isn’t great, but these bowls of ornaments look simultaneously casual, elegant, and quite simply, magnificent. I placed a set of lights at the the bottom of the bowl, added ornaments, plugged in the lights and that was it! 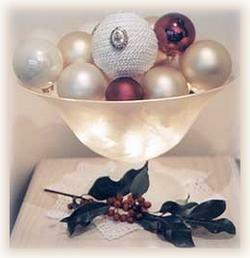 So easy, but such an evocative, eye-catching display for Christmas! »Use a strand of battery-powered lights for an arrangement that you wish to place as a table centerpiece, or where no power source is readily available.